Check that your query has proper semi colons for all statements. This will create a new git repo in the folder named learngit. We are ready now to use git within our local system. When we say git init , it creates a directory named .git inside the folder. This contains the stuff needed by git to work. If you want to copy existing code base in git to your local system , you have another way. This command it telling that i want this file to be considered for saving it git. When we say this , git stores that to index. git commit --message "Adding a new file"
This command saves the file which we added to index into the git. If you want to see diff only for specific file you can use above command. working directory and the index staging area. This command shows the summary in terms of line changes + and - , rather than details about changes. Tasks can have dependency with each other. If something is reusable tasks which is done again and again in different projects , we can abstract it as plugin. This plugin can be used in different projects and can be sourced by build file of projects. help Displays this help message or prints detailed help on requested commands (run 'help <command>'). about Displays basic information about sbt and the build. tasks Lists the tasks defined for the current project. settings Lists the settings defined for the current project. projects Lists the names of available projects or temporarily adds/removes extra builds to the session. project Displays the current project or changes to the provided `project`. set [every] <setting> Evaluates a Setting and applies it to the current project. session Manipulates session settings. For details, run 'help session'. inspect [uses|tree|definitions] <key> Prints the value for 'key', the defining scope, delegates, related definitions, and dependencies. ; <command> (; <command>)* Runs the provided semicolon-separated commands. ~ <command> Executes the specified command whenever source files change. last Displays output from a previous command or the output from a specific task. last-grep Shows lines from the last output for 'key' that match 'pattern'. export <tasks>+ Executes tasks and displays the equivalent command lines. 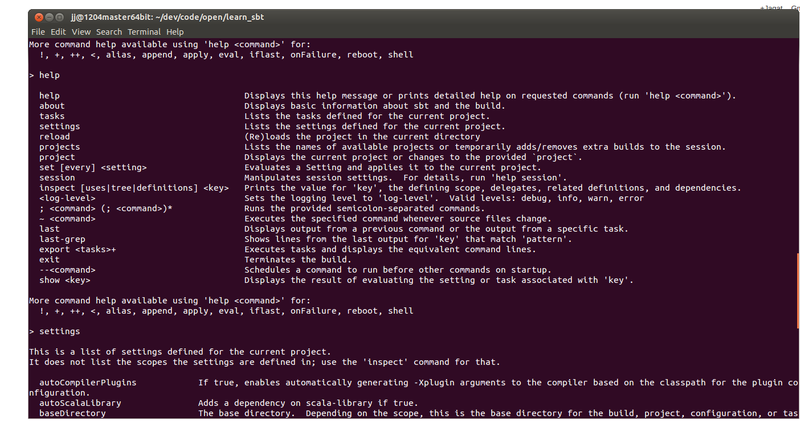 --<command> Schedules a command to run before other commands on startup. show <key> Displays the result of evaluating the setting or task associated with 'key'. This is a list of settings defined for the current project. It does not list the scopes the settings are defined in; use the 'inspect' command for that. autoCompilerPlugins If true, enables automatically generating -Xplugin arguments to the compiler based on the classpath for the plugin configuration. autoScalaLibrary Adds a dependency on scala-library if true. baseDirectory The base directory. Depending on the scope, this is the base directory for the build, project, configuration, or task. classDirectory Directory for compiled classes and copied resources. crossPaths If true, enables cross paths, which distinguish output directories for cross-building. fork If true, forks a new JVM when running. If false, runs in the same JVM as the build. initialCommands Initial commands to execute when starting up the Scala interpreter. javaHome Selects the Java installation used for compiling and forking. If None, uses the Java installation running the build. javaSource Default Java source directory. managedResourceDirectories List of managed resource directories. maxErrors The maximum number of errors, such as compile errors, to list. offline Configures sbt to work without a network connection where possible. publishArtifact Enables (true) or disables (false) publishing an artifact. publishTo The resolver to publish to. resourceDirectory Default unmanaged resource directory, used for user-defined resources. scalaHome If Some, defines the local Scala installation to use for compilation, running, and testing. scalaSource Default Scala source directory. scalaVersion The version of Scala used for building. sourceDirectories List of all source directories, both managed and unmanaged. sourceDirectory Default directory containing sources. target Main directory for files generated by the build. unmanagedBase The default directory for manually managed libraries. unmanagedResourceDirectories Unmanaged resource directories, containing resources manually created by the user. unmanagedSourceDirectories Unmanaged source directories, which contain manually created sources. version The version/revision of the current module. More settings may be viewed by increasing verbosity. See 'help settings'. More settings may be searched by increasing verbosity. See 'help settings'. The version of Scala used for building. It compiles everything that it finds and this gives you your build definition. sbt then runs this build and creates your artifact, your jar or whatever. file which sbt reads to work out what settings and tasks are available. Repositories of plugins and dependeicies are different from each other , it means If you've a repository which contains both plugins and dependencies of your artifact, you'll need to include in both project/plugins.sbt and build.sbt. but the version of scala which is used by sbt. At my work i login to server via an intermediary server. This should allow you to directly ssh from laptop to inter without password.